My brother got married this weekend, and my wedding anniversary is this month, so romance is on my mind! My hubs and I like to give each other meaningful gifts on our anniversary and go away for the weekend to just be together. I usually get a fair bit of reading done too, because my husband is the best husband ever. While shopping for gifts for him, I also, of course, did some shopping for myself to give him some ideas. And I thought I’d share them with you. 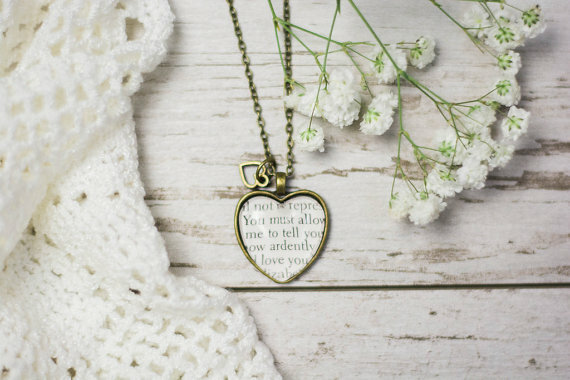 Created and sold by Authored Adornments on Etsy, this necklace is so sweet and romantic and pretty. And, since my husband proposed with a copy of Pride and Prejudice, it makes perfect sense for us. This text is also available in rings and in a bracelet. Tell me you wouldn’t love to wear something as sweet as this? So pretty and so subtle. Unless someone has read the book or seen the movie, they won’t know what this really means. Would you hand this in your house? I’d love to perch it on the shelves in my living room. This necklace is so simple but so stunning. 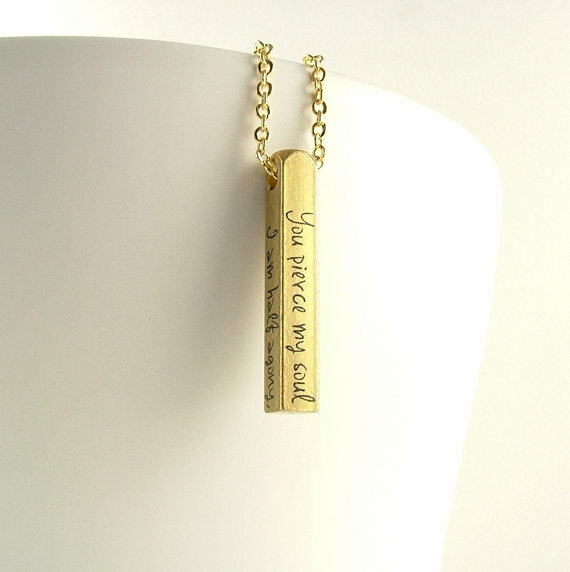 The quote reads, “You pierce my soul. I am half agony, half hope.” The pendant is solid brass too, so it will have a nice weight to it. I love how simple and elegant it is. It’s much more contemporary than I usually wear, but I really like it. Would you wear this? It is fall, and that means it is scarf weather. Anne and Gilbert were the first OTP of many readers. 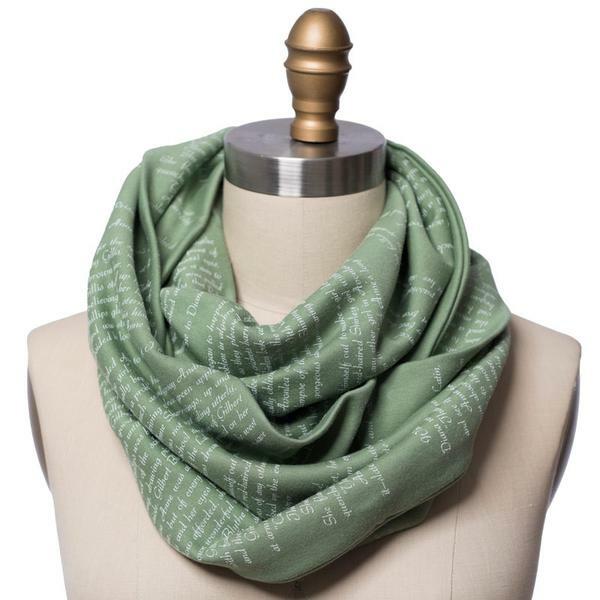 I love the sweet colour of this scarf and the thought of wandering through my day with Anne’s words as part of my outfit. 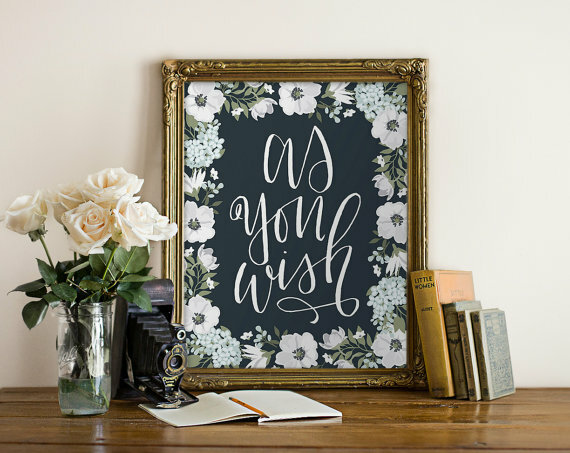 What bookish gifts would you love to give or receive? Don’t forget to enter my October True Love giveaway! Details in this blog post.